Work&Trade Espoonlahti has a visible location along Western Highway, in Espoo! Work&Trade means much more than business premises. As a pioneer in Finland YIT’s new concept solves companies’ unique needs of combination spaces. Work&Trade is a superior choice when you need a flexible rental space at a top location for a shop, office, production, storage, showroom or a combination of these. 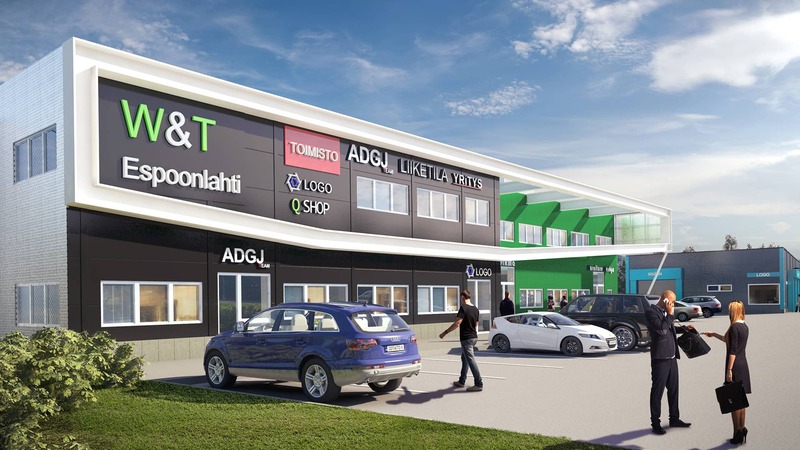 Work&Trade Espoonlahti will be built in a central location, in the intersection of Western Highway and Soukanväylä. Up to 70,000 people drive along Western Highway every day, which creates excellent preconditions for success. Work&Trade Espoonlahti will be located on a central site at an important traffic node in the Espoonlahti area: the intersection of Western Highway and Soukanväylä. Up to 70,000 people drive along Western Highway every day, which creates excellent preconditions for success. Espoonlahti has good bus connections. The Espoo centre of Tapiola is only 15 minutes away.